More than 95 percent of American homes own a microwave! This says a lot about our desires for a quick, convenient meal. Looking at the bigger picture, this isn’t entirely our fault. Our world has evolved into a fast paced race against time, and it doesn’t help that half the food in the grocery stores are packaged in plastic for quick consumption. Heating your food in the microwave strips away its original nutrients. The high frequencies emitted from a microwave force the water molecules to rapidly spin, creating friction which heats the food in a short amount of time. This completely changes the molecular structure of the food itself. 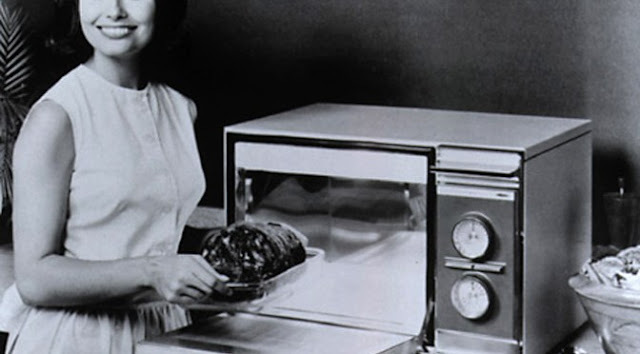 Dr. Joseph M. Mercola, a licensed physician writes that the dielectric heat in the microwave bounces around and is absorbed in the food until it evolves into a sort of ‘dead food’. The nutritional value greatly diminishes the longer the food absorbs the radiation. In a study published in the Journal of Agricultural and Food Chemistry, researchers examined the effects of microwave heating on the loss of vitamin B-12 in foods like raw beef, pork, and milk. What they found was the natural chemicals in vitamin B-12 became virtually inactive after the microwave heating process. Researchers tested 22 freshly frozen human milk samples for lysozyme activity and antibodies by heating the samples for 30 seconds on either a low or high power setting. Breast milk microwaved at high temperatures was found to have greater E coli growth — 18 more times than un-microwaved breast milk. If you do use a microwave, never wrap anything in plastic! You can create carcinogens in the food. The Russian government issued a warning about the health hazards microwave ovens can have on the human body and the environment. Foods that are frozen and meant to be heated in a microwave were found containing toxic chemicals such as BPA, polyethylene terpthalate, benzene, toluene, and xylene. They found that, with the eight participants in the study, their red blood cells decreased while white blood cells increased, along with their cholesterol levels. These levels are within federal safety guidelines but that doesn’t really mean anything. We are still getting daily doses of radiation. It’s been reported that you can experience a dramatic change in heart rate, have an irregular heart beat and chest pains if you regularly eat microwaved food. With all these studies, and even just the sheer knowing that a higher level of radiation is coming out of a device in our homes, it seems like a good idea to throw them out. Or at least not use them as much. A lot of food is designed to only be cooked in a microwave and this is no mistake. We are bombarded with unhealthy choices due to convenience. In the end, it’s completely worth it to take the time to cook full meals. It may be more time consuming but our bodies will thank us for it!